Creating and mixing music is no different than any other creative profession. You develop a workflow that works for you, and along the way you begin to rely on a few key applications. For me, Drumagog and EZplayer pro are those applications. 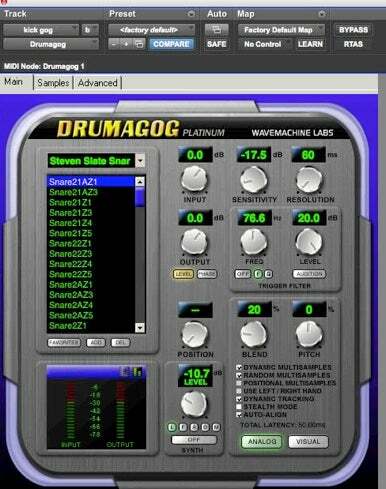 In its simplest form, WaveMachine Labs' Drumagog (Basic version, $199; Pro vesion, $289; Platinum version, $379) is a sound-replacement utility. This means that you can record a drummer and then, in post-production, replace the sounds that you recorded. The obvious question is why would you go through the trouble of recording a drummer only to replace the sound of the drums? There are plenty of reasons. For instance, part of the magic of a song is the feel of the band playing. Capturing the way a band gels is not something can be easily duplicated in software. So, having that feel is important, but what if one of the drums is dead or out of tune? That’s enough to ruin the entire sound. With Drumagog, you can replace the sound of that one drum to bring everything back into line again. It can be that simple, but you can take it a lot further as well. Drumagog detects a spike on the audio track and replaces that audio spike with a drum hit. So, if you put Drumagog on a Tom track, you would pick a Tom sample from the application’s menu and every time the audio spiked, Drumagog would play its sample instead of the recorded Tom. It can be that simple to use, but Drumagog is also a full-featured plug-in. You can use the filtering and ducking options that will allow hi-hats to come through the snare microphone, but will replace the sound of the snare itself. You can even blend the sound of the sample with the original hit if you want, a feature that allows you to really control the sound of the drum kit. You can also adjust the sensitivity of Drumagog to make sure it picks up all of the drum hits on your track. I recently recorded a song and the kick drum just wasn’t powerful enough for my liking. I tried a few things to pump it up a bit like adding a compressor plug-in to the track, and trying parallel compression. (Parallel compression is a process of sending the drums to an auxiliary track, heavily compressing it and mixing that sound back into the mix). Nothing that I tried really gave me the sound I was looking for. What I did was duplicate the kick track and add Drumagog to that track. I then used one of the kick samples from Steven Slate Drums as my second kick. I adjusted the sensitivity, blended the Drumagog kick with the original kick, and ended up with a nice thick drum sound. When I start writing a song, one of the first things I do is make a good drum groove. That gets me in the mood to start playing my guitar and write some inspirational music. The problem is that there are so many drum products on the market that you have to make a decision right away on the want you want to use for that song. BFD2 has its own drum kits and groove libraries, as does DrumCore, Superior Drummer, Ocean Way Drums, Steven Slate Drums, and Addictive Drums. I have them all. 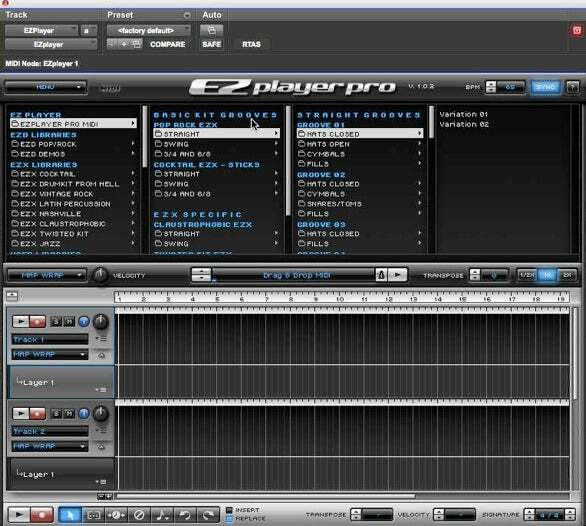 Toontrack's $49 EZplayer pro solves this problem by changing the MIDI notes of a drum groove or fill on the fly. That means I can use a groove made for Superior Drummer with any of the other products. Brilliant. I looked back at some of my projects and EZplayer pro is on every single one of them. It’s that useful for me. Typically, I’ll pick the drum sampler I’m going to use and then put EZplayer on a separate instrument track. I can then scroll through a list of MIDI grooves and samples in the EZplayer interface and hear them through the drum sampler that I chose. I can change drum kits or even change drum samplers to make sure I get the sound I’m looking for in that song. The other way to test MIDI grooves is to load a drum sampler and then manually drag and drop MIDI into the track. If you don’t like it, delete the MIDI and drag and drop another. Not nearly as efficient as being able to scroll through a list of grooves, fills, endings, and beginnings in EZplayer to find what you are looking for. Like Drumagog, EZplayer Pro is a simple application to use, but it’s also packed with features. You can transpose MIDI, adjust the velocity of hits, and even build entire song tracks without leaving the application. Drumagog and EZplayer are truly a couple of the best music applications on the market.